Why have I not reviewed this yet? I swore I had. Clearly, I write too much for CelebMix and just presume I write reviews on the music videos I cover on there. I did cover this for CelebMix, and now it's time to review it on my blog. I love this music video and the song is definitely a grower of an anthem. It's certainly not a typical song from a Disney star, but when has that ever mattered? Music is changing and Sofia Carson has decided to be a part of that wave. This song is a fundamental part of that change. 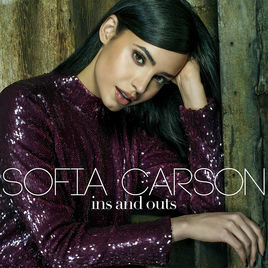 Watch Sofia Carson and Twan Kuyper explore New York together on their adorably cute date in this music video for "Ins And Outs". Sofia Carson is best known for playing Evie in Descendants, as well as the sequel. She's also in A Cinderella Story: If The Shoe Fits and Adventures In Babysitting, the latter of which still has not been released in the UK on DVD - I am waiting for that day. She is currently working on an album, and this is her most recent release. This song just shows that she's on to something special when it comes to her music, and I am so excited to hear even more new incredible music from her. This song was written by Julia Michaels, Justin Tranter, and Jason Evigan. As for the music video, this was directed by John-Michael Triana. It co-stars YouTuber and actor Twan Kuyper as Sofia Carson's love interest. They go on a date, where they just spend time together in the city of New York. She's completely fashionable throughout the video, wearing three completely different outfits. The red dress is certainly my favourite. There are two performance pieces interspersed between their date, where she brings the longing fire needed for this song. It's clear she has connected to the song on a personal level. As for the date itself, they go to an arcade and play on some of the machines before walking around Manhatten and ending up on the rooftop of her apartment. It's cute but there really isn't much of a love story apart from some connection moments. It's sweet, innocent, and completely cute.